Jesus - Democrat or Republican? The Campaign has begun! Join us and share with others as a testimony that your heart and life is devoted to Christ. "But I tell you that men will have to give account on the day for judgment for every careless word they have spoken. For by your words you will be acquitted, and by your words you will be condemned". Matthew 12:36-37. Most Christians profess that Jesus is the most important thing in their lives; however, many spend enormous time and resources for politicians. They donate large sums of money to a political party, put a candidate's sticker on their car and perpetually argue politics. Think about how much money and effort it takes to elect a president, state senator or congressman? Now think about how the resources of Christians could be used to promote Christ and help others in need! Regardless of the current political power, God is ultimately in control of determining our fate, not mankind. How Did This Ministry Get Started? This unique "peel and stick" ministry's sole purpose is to harness the growing discontent of our nation's electorate to encourage all people to rededicate their lives to serving our Creator rather than place such disproportionate importance on political parties and / or candidates. Please join "The Campaign" and elect Jesus Christ as your life leader. Buy a Bumper Sticker or Yard Sign today as donation and to help spread the message! HOW DO WE SPREAD GOD'S MESSAGE? All you need to do is simply "peel and stick". Place one of these bumper stickers on your car or put a sign in your front yard or church for all to see. God will help do the rest. Also be prepared to give your own personal testimony of why Jesus is your life leader because the signage will get people's attention. It's helpful to have a few extra bumper stickers to give as gifts to further spread the message. YOUR CONTRIBUTIONS HELP US EXPAND THIS MINISTRY! Please help us spread and sustain this unique evangelistic ministry where wegive away over 80% of the bumper stickers and yard signs created to point others to Christ. Buy a Bumper Sticker or Buy a Yard Sign for yourself and extras to give to friends. Sales proceeds cover printing and website costs in addition to subsidizing the many we give out for free. Consider using our stickers and/or yard signs to raise funds for your church or organization. CLICK HERE to find out more! Consider starting an "Elect Jesus" campaign headquarters in your own town to help spread this unique ministry's message. 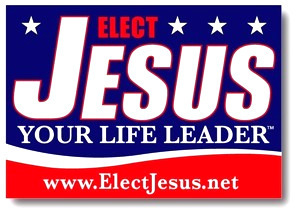 All "Elect Jesus" designs and slogans are original and trademark protected. Scripture taken from the HOLY BIBLE, NEW INTERNATIONAL VERSION, Copywrite 1973, 1978, 1984, by International Bible Society, Used by permission of Zondervan. All rights reserved.